Howard Roark, are either dead or living in void. I know exactly what someone has to go through to live like Roark. it is my most loved book too. I read it, when I was having a terrible time of my life. I had to do things against my parents and relatives( you can guess how painful they can be). I thought of him as my idol, and I think myself to be him. ( I dont fully justify to his character, but I do atleast 50% of him). Well I am still waiting to be successful in my eyes, and in the eyes of my parents and relatives..
Not even our unofficial father of the nation was ... the entire man of his principles and standing by them..
@ Renu : Like in the novel, in reality also no one loves people like Howard roark and on top of that, to find a woman like Dominique is even next to impossible. 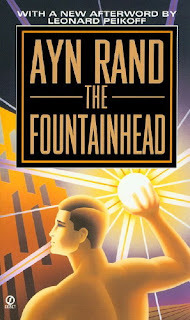 Fountainhead clearly depicts what the world actually needs but the doubt reamins - Are we in general ready to accpet charaters like them? Are we in general stand by their side? Leaving Western society alone, I say that Indian soctiety would never ever accpet a man and woman like Roark and Dominique respectively. I too love this book. I don't know how many times I've read this book. My heart always goes to Howard Roar, who never knewhow to go along with crowds. TO be like Roark and Mallory is no less than a life in misery. Once i stood like Roark and I faced its consequences. Though I believe I did nothing worng but my that action has taken away what was my rightfully. A crisp post that makes one think! Interesting post! Though I am yet to read the book completely. I have in bits and pieces read it. And from what I read, I found its difficult to find someone like Howard Roark. It is too high an expectation I suppose, considering the world we live in! Used to love both these books as a teenager and in my twenties. Haven't read it in a while and am wondering how I'll see the characters now. Remember their names but little else. Worth a re-visit, I think.